Cancer of the skin is a change in your skin cells during which they grow abnormally and form a malignant tumor. These abnormal cells can invade your body, become implanted in other organs, and continue to grow, a process called metastasis. The skin is the most common part of the body in which cancer develops. 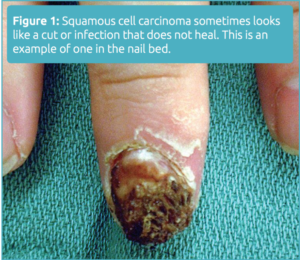 Squamous cell carcinoma (SCC) is the most common type of skin cancer of the hand, followed by basal cell carcinoma and melanoma. There are other, more rare forms of this cancer such as Kaposi’s sarcoma, dermato- brosarcoma protuberans, sweat gland tumors, and Merkel cell carcinoma. This type of skin cancer may look like small, firm nodules on the skin. They are often brown or tan in color and may result in scales, ulcers, bleeding, or crusting. The scaly, crusty top layer can build up, creating a cutaneous horn. Some people may mistakenly think that the cancer is just a cut or infection that won’t seem to heal (Figure 1). For some, SCC will result in large, mushroom-like growths. SCC has a high potential to metastasize, especially to lymph nodes. This type of skin cancer results in small, well-de ned nodules with a translucent, pearly border. These too may ulcerate and look like a chronic sore. They tend to be slower-growing, with less of a tendency to metastasize. Melanomas often look like moles or birthmarks. Any of the signs shown below, also known as the ABCDEs of melanoma, can be a sign of the disease. Diagnosis starts with you asking your doctor to inspect your skin. A careful history and physical examination will be performed. A biopsy will be needed to con rm that the lump is malignant. This can be done by either taking a small part of a big lump or entirely removing a small one. The lymph nodes should also be examined, as they are a common site for metastasis, especially for melanoma and SCC. Other evaluations, such as a sentinel lymph node biopsy, CT scan, and/or PET scan may be needed to check for metastasis, especially with melanoma. The standard treatment for skin cancer is surgical removal of the cancer. Additional treatments such as radiation and/or chemotherapy may also be needed. • Wear protective clothing and sunscreen in the sun. • Avoid exposure to high-risk chemicals such as arsenic. • Check your skin regularly with a dermatologist and show any abnormal skin problems to your doctor right away.